Metalsmithing is my meditation. Even though it can be loud, dangerous, and frustrating, the process of turning metal into art-to-wear it is how I calm my mind. The process of creating a beautiful piece of jewelry is also fun, invigorating, and immensely satisfying! I like minimalism, modernism, geometric forms, and clean lines. I'm inspired by nature, water, geometry, and serenity. My goal is an elegant design that can be worn for a variety of occasions. Each piece of jewelry is lovingly hand-crafted with the utmost care and attention to detail. Please see the slideshow to the right for some photos of my studio (organized chaos!) and my tools. Everything I sell is made in this cozy little space. I hold a B.A. in studio art and art history from St. Olaf College in Northfield, Minnesota. 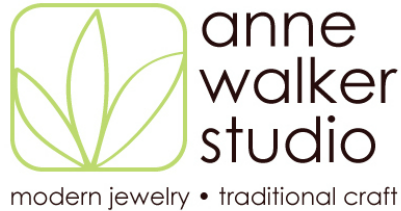 I began making jewelry in 1997, studying the craft at the Spruill Center for the Arts in Atlanta, GA. I also studied privately with a local jewelry artist. I currently work from my Atlanta-area studio. See photos of my studio below.